The Winter Olympics are now 5 weeks away, and many of you in the United States are starting to see the advertising on NBC. As in the past, my goal this year is to take all of you along with me, to show you the behind the scenes of the Games, through stories and photos. Many of you have followed the daily blog posts from previous Olympics, but I never really talked about the preparations and planning that goes on in the months before the trip. Many people have asked about this process, so I decided to write this post. The first of many posts related to the Sochi Olympics! For us photographers who will be at the Olympics, the preparations actually started about 18 months ago. Believe it or not, I was working with the US Olympic Committee on the application process for Sochi, while still in London shooting the Summer Olympics for them. There are many organizations who apply for photography credentials for the Olympic, but very few available to be handed out. For this reason, the USOC starts this process early to determine who will be granted access. Having photographed numerous Olympics in the past, they know me well and trust that I will deliver high quality photos in a timely manner. This helps me make the cut each time, and for that I am very fortunate. But nothing is ever guaranteed! After applying for the credentials, there is a 6 month waiting game. At this point the USOC has to work their magic and determine who goes. And...there are different levels of photography credentials. There are some that only let you into a specific venue, so for instance, a speed skating photographer would only have access to the speed skating venue. I want the credentials that let me go into any venue to shoot. This is the EP credential, or what I call the "golden ticket". The credentials for the Olympics also act as my visa into the country. 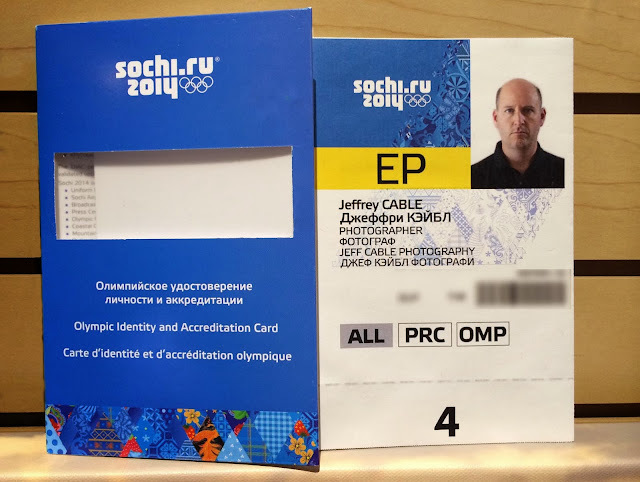 Since these give me access to the country and the Olympics, there is a substantial security screening process happens a year before the Games. I just received my credentials two weeks ago. This is always an exciting day for me, as it signifies the beginning of another amazing journey! I know what you are thinking. You are saying "Jeff sure doesn't look very happy in this photo." But the Olympics, much like the passport office, do not allow you to smile for these official photos. Trust me, I was happy to apply for this. And when I got these credentials, it was cool to see my name in Russian. That is a first! In the next Olympic blog post, I will tell you about all the logistical challenges of Olympic preparation. This involves what equipment to take, what events I will cover, the contracts, and the travel. And trust me, making travel plans to Sochi, Russia is a lot harder than Vancouver or London. Oh, and remember to put your email address in the top right section of this blog to be notified all of new blog posts. This way, the blog will be emailed to you, so you can easily follow along on the Olympic ride. Today is the last day of the "Jeff's Favorite Things" contest! Hopefully you have already entered the "Jeff's Favorite Things" contest for your chance to win some of the $3000 worth of prizes. I wanted to remind all of you that today is the last day of the contest (ending at midnight tonight). And remember that when you refer a friend, this enters them in the contest and also gives you an additional "name in the hat". Yes, there will be 21 people winning prizes! Good luck to all of you, and happy holidays! 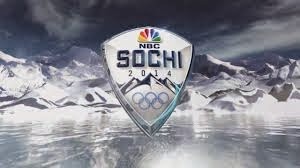 As many of you know, in 6 weeks I will be heading to Sochi, Russia to photograph the Winter Olympics. Just like the Vancouver Olympics in 2010, the primary sport I will be covering is ice hockey, for Team USA specifically. For most people, Olympic preparations means that you put aside some time to watch the game on TV or you set your DVR to record your favorite sports. For me, every Olympics means more than a year of planning. In the coming weeks I will include you all on the preparations and the process. Part of the prep for the Games, is practicing my photography skills for the action that I will be covering in Sochi. So...last week, I shot the San Jose Sharks game, and it was a really good thing that I did. You see, even though I shoot photos all the time, each type of event has it's own unique challenges, and I needed to refresh myself on the best settings for hockey. I started shooting photos from a higher level. For these shots, I used the Canon 1DX with the Sigma 120-300 2.8 lens with a Sigma 1.4x tele adaptor. I know from past Olympics, that they have shooting positions from this level and I wanted to test my skills. It is easier to shoot from this high position, than from the glass. As long as I stand towards the center of the rink, I can capture action almost anywhere on the ice. But what I don't like is, this perspective does not bring the viewer into the action. We are above the action instead of being in it. I shot the first period from up above, and then moved down to an ice-level position and changed to the Canon 70-200mm 2.8 lens. The NHL has holes in the glass which allow us to shoot nice clear images of the game. There are three problems with these holes. First, you have to be VERY careful shooting through them, since the hockey players often check each other into the boards and can smash that camera right into your face (and I have seen this happen). Secondly, that puck can come up high and hit and damage the front of your lens. Third, when shooting through the holes, you have a limited field of view which you can shoot. And lastly, there are not many holes, and it is difficult to get an open position if many photographers are there to cover the game. But, as you can see, the photos are MUCH better because now you are "in" the game as opposed to being "above" the game. For hockey (and most other fast action sports) I usually set the camera to aperture priority mode or manual mode, making sure that I am achieving a shutter speed of at least 1/1000 sec. I also set the focus mode to AI Servo so that the focus is changing as my subject is changing distances from me. I also use back button focusing (where you set the shutter release button on the camera to take photos but not change the focus and then use one of the buttons on the back of the camera to separately control the focus). My first mistake was not changing the focus mode of the camera. For the first part of the game, I was shooting with a single point of focus as opposed to a cluster of focal points. This made it more difficult to get sharp focus on the skaters face. Honestly, my take-rate (ratio of good shots to bad) was not acceptable for me. I also needed to hone my skills for when to fire off shots. As you see in this photo (and many of the others), it is good to have the puck in then frame. Even though my lens would let me shoot the photos at f2.8, there was enough light to shoot at f4, which allowed me to get more of the athletes in focus. In this photo, the skaters and goalie are sharp, but the puck is coming towards me and a little soft. One of the reasons that shooting at ice level is so much more appealing to me, is that you can see the intensity of the hockey player's eyes. And get in close to the action. One thing to remember when photographing sports, is to keep shooting even when the action is over. In this case, Thomas Vanek celebrates a goal late in the third period to tie the game. As the game progressed, I started playing with the different focus refinements of the Canon 1DX, setting the tracking sensitivity for "subjects that accelerate or decelerate quickly". I love this shot of Brad Stuart passing the puck. When I first saw this shot, I thought, "this is a great shot of him concentrating on the pass, but it would have been better if the puck was in the shot." And then I looked closer and saw the puck flying away from him, just to left of the image. As I have taught in the past, it is really important to know the nuances of a sport in order to capture the key moments. Since I play hockey, I know how important it is to get in front of the net to screen the goalie. This photo is a perfect example of how the Islander player is doing that and trying to deflect the shot, while the San Jose Shark player does his best to disrupt that attempt. More practice and more preparation in the coming weeks. 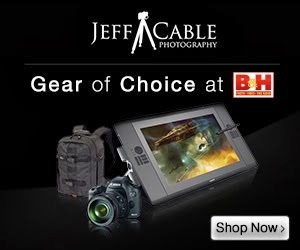 Win Jeff's favorite things - A contest with $3000 worth of photography gear! Remember when Oprah Winfrey would give away her "Favorite Things" to her audience? While preparing for the upcoming Winter Olympics, I have been working with all my friends in the photo industry. Along with me getting some cool new toys to play with in Sochi, I wanted to give away a bunch of my favorite things to you. I am talking about more than $3000 worth of goodies from some of my favorite companies in the photography industry. Sign up here for a chance to win! The MORE PEOPLE your refer, the MORE CHANCES you have to win. Have fun - and I hope you win some of this great equipment! A crazy story about a fun family portrait shoot, 3 old VW buses, and a lost Gitzo tripod! We have friends who really wanted a family portrait, and since they also have a cool collection of old VW buses, we saw that as a cool opportunity to shoot a unique photo for them. The last time they had taken a proper family portrait was 14 years ago, when the kids were tiny. Thanksgiving weekend proved to be a perfect time to meet up with them to shoot photos of them and their VW microbuses. On Saturday afternoon, the family showed up to the house with a caravan of VWs, where we met up and planned the day. We had decided in advance, that the proper location for the shoot would be at the beach. We had 5 vehicles in total, as we headed out for the shoot. The funny part was...one of the buses could go no faster than 58mph, so it was a slow trek. I am so used to driving fast, that it felt like we could get out of the car and walk at 5 the same speed. 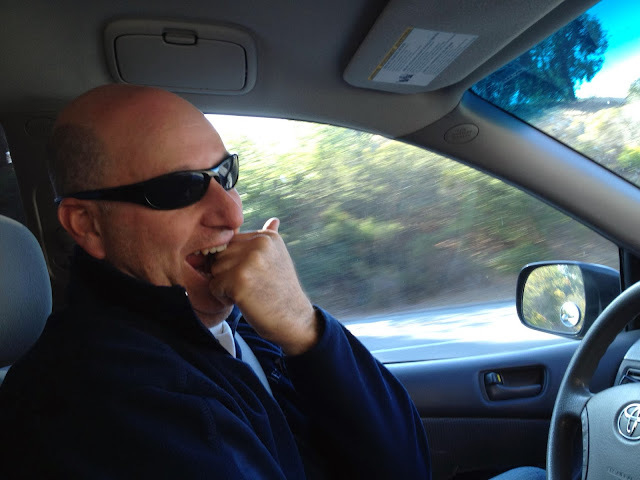 My wife took this photo of me driving, while she laughed at my frustration. 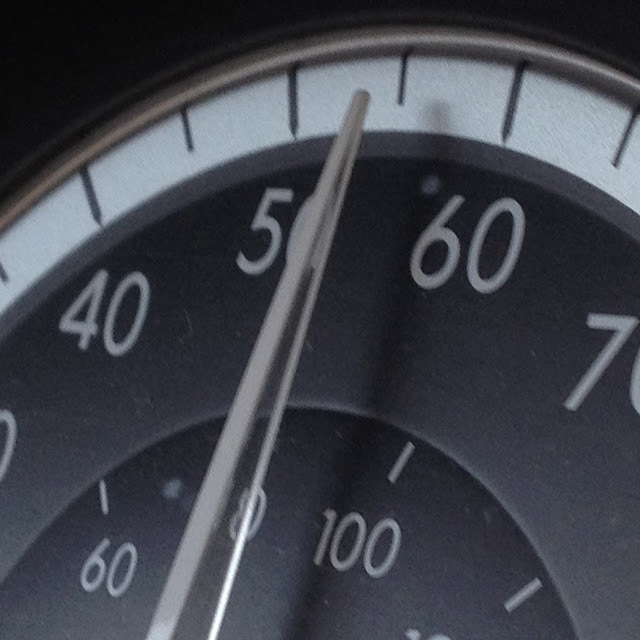 Yes, we were really driving 55 MPH on Highway 280 while everyone flew past us. And then, after an hour of driving, we arrived at a beach near Half Moon Bay. I was happy to see that we had really overcast skies, which meant no harsh light to deal with. But it also meant that we would have a white background and not see any of the ocean. I had them park the buses in a formation where I could shoot the family by the front of each vehicle. I used my Canon 1DX with the Canon 24-70 II lens and a Canon 600-EX-RT flash. When planning this photo shoot, I knew that I would try converting these to either black & white or sepia to give them an aged look. As it turned out, I ended up using one of the "Old Photo" filters in NIK Color Efex Pro to get this result. My wife took this photo (with her iPhone) of me shooting the above photos. We wanted to get a photo of the family with just one of the buses. And this particular model had a sunroof, which gave us a fun way to set up the family. This is one of their favorite photos from the day. Once again, using one of the "Old Photo" filters in NIK Color Efex Pro to get this result. After getting the natural pose, I asked all of them to raise their hands and have some fun. I love this shot. And yes...you guessed it...once again, using one of the "Old Photo" filters in NIK Color Efex Pro. 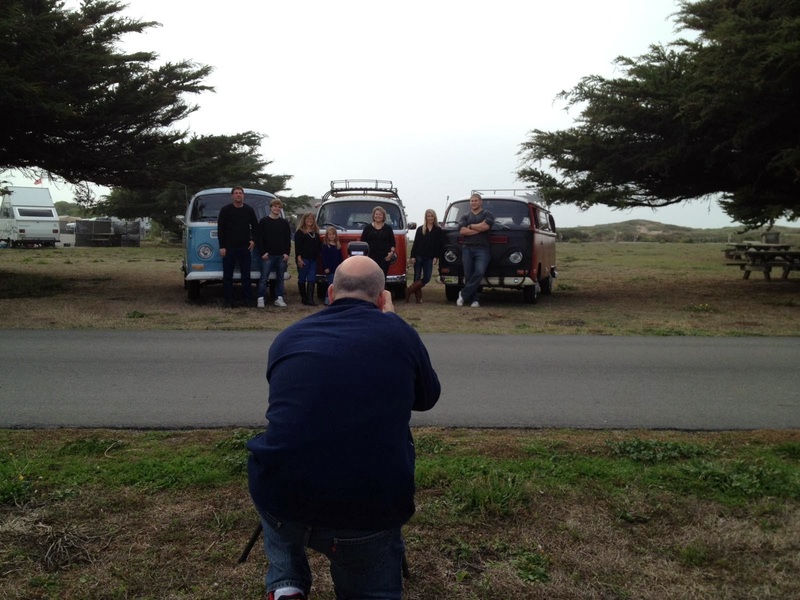 After taking the straight-on photos, I also wanted to take some family photos from different angles around the VW. I like having a variety of images to show the family. For this B&W version, I used NIK SilverEfex Pro to try a different look. After shooting on the grass by Half Moon Bay for a while, we decided to drive South along the coast to see if we could find a better location. After driving for a while, the overcast skies were getting thicker, so we decided to pull over at a beach called Ponponio Beach. I had the VW's pull up parallel to each other and staggered a bit. I then had the family stand by each of the micro buses and shot this. Since I wanted to shoot at a smaller aperture (to get everyone in focus) I kept the camera on my favorite Gitzo tripod to make sure the camera did not move at all. The "old photo" look again. Again, I tried different angles. Look how different the photos are from one an another with me moving my shooting position. As we drove from the first location to the second, I was looking at the microbus in front of us and liked all the stickers. For this shot, we all walked around to the back of the buses and shot more photos. Again, I kept the camera on my tripod since my shutter speed was down to 1/20 sec. The kids were getting cold and they were just about done shooting photos. But we wanted to get some portraits of the couples before leaving. I took the camera off the tripod and changed to my Canon 70-200mm lens, since I knew that I could shoot these images at f2.8 or f4 and handhold everything at this point. I moved the tripod out of the way and I shot a bunch of portraits. Just before leaving, I changed lenses one last time. This time I switched to the wide angle Canon 16-35mm lens to take a group shot inside one of the vehicles. As I was just about to pack up my equipment, I saw Daryl sitting in the van and asked him to look at his mirror. One last shot, and a fun one at that! Traffic was horrible and we arrived back at my house just before 6pm. I hopped out of the VW and opened the side door to grab my LowePro x200 rolling bag. And then I looked around for my favorite trusty Gitzo GT2530 tripod. It was at this very moment that I realized that I had never put it in the van and that it was still back at the beach parking lot, where I had put it aside during the shoot. I must have turned white because Daryl saw the panic on my face. I swear, I thought I was going to be sick. Remember, this is a very expensive tripod! For the rest of the night, I entertained guests at our house and all I could think was "damn - I am SO stupid for leaving that tripod back at the beach!" The next morning, I woke up at 5:45am thinking the same thing and beating myself up over this. I called the rangers office and talked to the ranger who happened to be at the beach the day before. He said "Oh, are you the guy that was photographing the people with the old VW vans?" So...he remembered me, but unfortunately, he did not have the tripod. The ranger even called me back after searching for it again. I was really bummed. Wow!!!!! I can not tell you how thrilled I was to read this message!!! 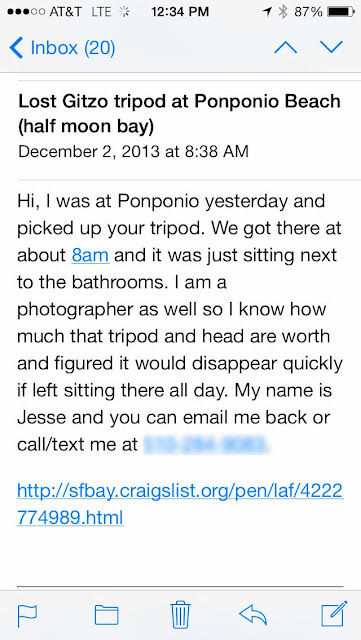 I was happy at the thought of getting my tripod back, but even more thrilled to see another example of someone being honest and responsible. 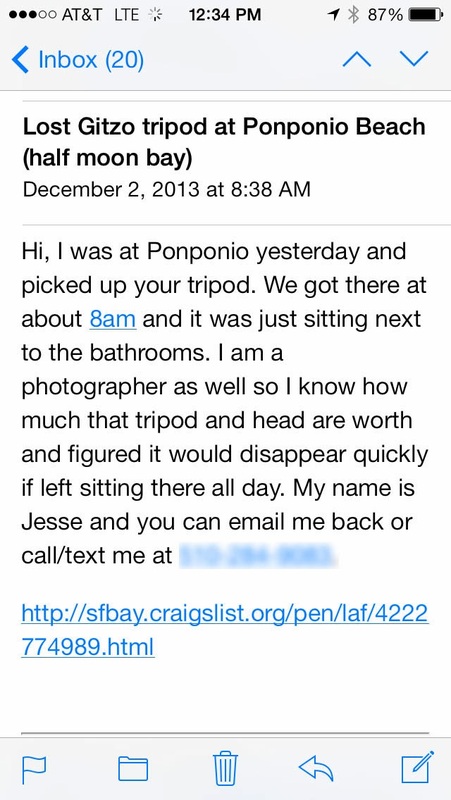 This guy could have easily kept this $1000 tripod. I called Jesse immediately and thanked him from the bottom of my heart. As it turns out, he did try to find the owner at the beach. He took it home and his wife suggested that he check Craigslist's Lost & Found. He typed in "Gitzo" and my post came up immediately. Wow, this technology really works! We made arrangements to meet that evening and I promised him that I would give him a reward. I gave him some money and also spoiled him with a bunch of Lexar goodies. And...he and his wife asked if I would do family portraits for them some time soon. Without any hesitation, I said "DONE!" I can't wait to do those photos for this amazing family. Another way that I can pay them back for being such good people. Thanks again to Jesse and his lovely wife!!! !